“Lens Blur” Turn Photos in 3D Wallpapers for Android: The HTC impressed virtually all photography fans and Android smartphones with its new technology to simulate selective focus on new HTC One M8 but Google does not remain long ago releasing its new Google Camera application. Without the need for a secondary chamber, this application is capable of determining focal lengths of relatively effectively. This capability not only offers the ability to capture photos with selective focus, but can also be applied in post processing a 3D effect that can then be used as ” live wallpaper “. 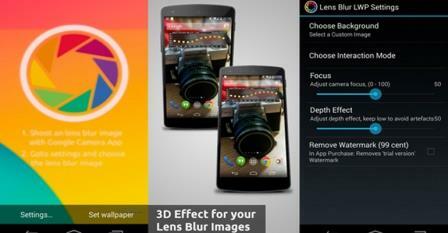 The application now enables us to perform this transformation to ” live wallpaper ” of our photos taken with Camera Google application called ” Lens Blur Live Wallpaper “. This is an extremely simple application to use , only need to capture a few photos with the functionality ” Lens Blur ” present in Google and then use the Camera application to turn your photos into ” live wallpapers ” interactive. To create your new role as interactive wall just to address the wallpapers settings and in section ” live wallpapers ” will now show the ” Lens Blur LWP ” option. After selecting the ” Lens Blur LWP ” you must select ” Select Background ” in the settings and then select the picture you want to view in 3D as your wallpaper. You can download the application for free on Google Play Store and start now to create your own interactive roles seems !